What Are the Benefits of Sunflower Seeds for Men? Men have higher rates of diet-related diseases than women, according to the Palo Alto Medical Foundation. Making healthy food choices will not only decrease your risk of chronic illness, but also improve your quality of life. Nutrient-rich sunflower seeds offer a number of health benefits for men, making them a healthy addition to your diet. Men like to eat meat because they equate it with more muscle, says the Academy of Nutrition and Dietetics. But eating too much meat -- such as beef and pork -- can increase your intake of unhealthy saturated fat and cholesterol. Sunflower seeds are a good source of protein and offer a healthy alternative to meat proteins. A 1/4-cup serving of sunflower seed kernels contains 7 g of protein, meeting 14 percent of your daily value. The 2010 Dietary Guidelines for Americans recommends you vary your sources of protein to include foods like sunflower seeds to maximize your nutrient intake. Sunflower seeds are a high-fat food, with nearly 80 percent of their calories coming from fat. But most of the fat in the sunflower seeds comes from the heart-healthy monounsaturated and polyunsaturated fats. Replacing your saturated fat intake with these healthier fats can improve blood cholesterol levels and lower your risk of heart disease. The American Heart Association recommends that most of your fat intake, 20 to 25 percent, come from these heart-healthy fats. The Academy of Nutrition and Dietetics recommends men include more potassium-rich foods in their diet to meet their daily needs of 4,700 mg a day. Sunflower seeds can help you meet those needs, providing 226 mg in a 1/4-cup serving. Including more potassium-rich foods in your diet can also improve heart health. Potassium helps to counterbalance the effects of sodium in your blood and can help lower blood pressure, reducing your risk of developing hypertension. Sunflower seeds are also a good source of zinc. Adequate intakes of zinc are important for male fertility. A lack of zinc in the diet may cause your sperm to clump together. Men need 11 mg of zinc a day. A 1/4-cup serving contains 1.75 mg of zinc. Sunflower seeds are also a good source of antioxidants, including selenium and vitamin E. Antioxidants are substances in food that can help prevent or limit oxidative damage to your cells. 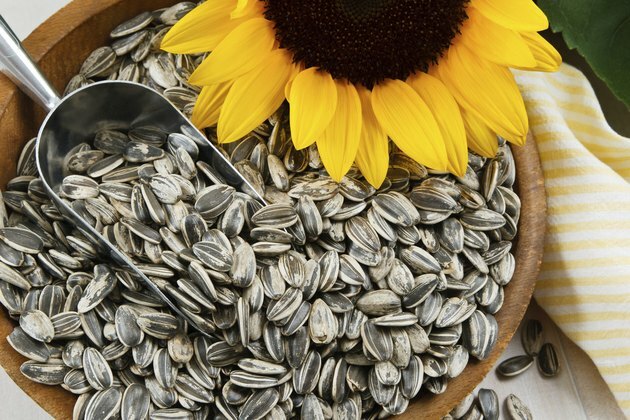 By limiting damage, the antioxidants in the sunflower seeds may help protect you from chronic diseases such as cardiovascular disease, diabetes and cancer.